The Fifth Circuit Court of Appeal is allowing members in good standing of the Louisiana State Bar Association, to file documents electronically without physically coming to the courthouse. 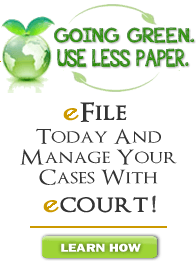 Any eFiled submission(s) to the Fifth Circuit Court of Appeal will be processed by our Clerk's Office as would any hard copy filing. Any electronically filed document received by the Court on or after midnight (i.e., 12:00 A.M.) will be file stamped on the next court business day. Any questions about the efiling processing should be directed to our Clerk's Office at (504) 376-1400 during our normal business hours. If you would like to learn more, visit our eCourt website at https://ecourt.fifthcircuit.org. The Fifth Circuit Court of Appeal is delighted to launch its new responsive websites to accomodate the growing number of users accessing the websites on their smartphones and tablets. Responsive website designing allows for websites to respond to the devices, and to the devices, and adjust screen resolutions, whether viewing on a computer, laptop, tablet or phone. It involves the use of flexible design layouts, grids, graphics and CSS media queries. Therefore, our sites will respond to your device's width and adjust accordingly. You can try it on your phone now, or by simply shrinking your browser's width to see the new look. The Fifth Circuit Court of Appeal, State of Louisiana is proud to announce the development of an Electronic Court System (eCourt) allowing registered counsel of record a wide range of services. This portal will allow for a SINGLE log-in, utilizing a uniform authentication process, to cases that you are enrolled as attorney of record. Copyrights © 2014 & All Rights Reserved by Fifth Circuit Court of Appeal.